Pietro Roccasalva’s work poses problems to those looking for legible meaning. Although his visual language of recurrent symbols and metaphors looks very much like it should be in some way translatable, most of its etymologies are so deeply entombed in Roccasalva’s eccentric logic that even those closest to him – assistants and gallerists, for instance – are sometimes at a loss to decode it. That is not to say that they don’t try. The near-1000 word press release for his exhibition The Strange Young Neighbours (the artist’s first solo in the US) goes into some detail about the source of the large tableau vivant in the centre of the gallery (namely, the opening shot of Pier Paolo Pasolini’s La Ricotta, 1962) and the show’s title (from a tale in Goethe’s novel Elective Affinities, 1809). But why he chose to collide these references is less clear; it may have something to do, as does all of Roccasalva’s work, with his Sisyphean artistic quest for simulation by dragging images into the third and fourth dimensions, and in creating images that seem to inhabit these dimensions even as flat drawings or paintings on the wall. ‘You never look at me from the place I see you’, lamented purple neon text at the entrance to the gallery. The phrase, on loan from Lacan and frequently used by the artist, repeated and twisted around on the wall to make a textual Mobius strip; its inverted letters could be read in the glass of the gallery’s window. Markedly different in tone, though perhaps not in spatial effect, were the paintings and pastels that surrounded the large tableau vivant. In muted colours and soft crosshatching, Roccasalva assembled a crew of waiters, each presenting a silver platter bearing a silver lemon squeezer. 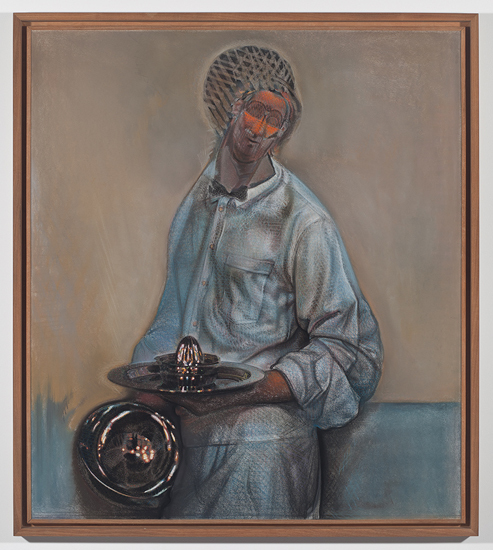 While the waiters’ faces collapsed into primitivist, mask-like abstractions, the silverware was shinily rendered, its surfaces mirroring remote spaces such as, in the pastel Il Traviatore (2011), Venetian arcades. As with the neon piece, Roccasalva beckoned his viewers through a perceptual wormhole and encouraged them to look at the artwork from the other side. The glass in the pictures’ frames seemed unusually reflective. 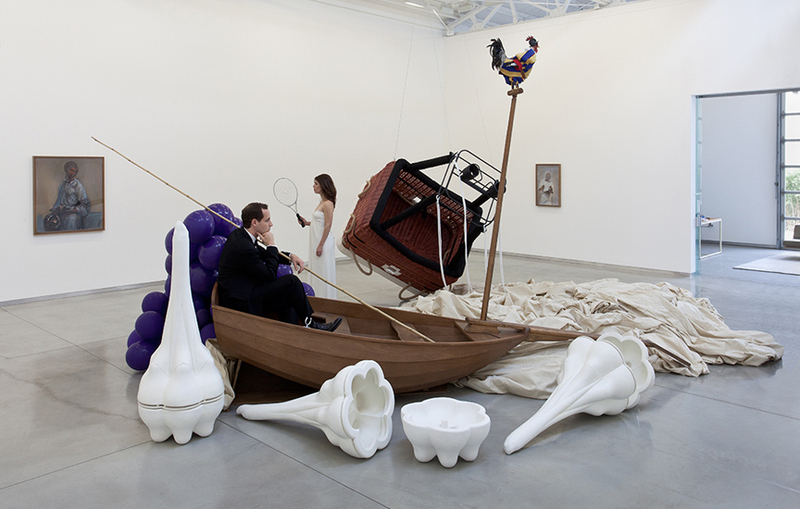 It is likely that the artist wanted viewers to see the installation behind them, Untitled (Just Married Machine #1) (2012), even while facing the pictures. A shot of a food-laden table from Pasolini’s film was transfigured into oversized sculptural surrogates: a platter became a boat, a bread basket was scaled-up into a hot air balloon and, in place of a bottle, a woman in a wedding dress clutched a modified tennis racket. Her husband (the actors were married in real life) sat in the boat. The specificity of real objects and real people, however, obstructs the kind of time travel facilitated by Roccasalva’s paintings. In an oeuvre in which every image slickly defers to another, the abrupt reality of a tableau vivant gives one rare occasion to pause.